As part of the Clifden 2012’s year long celebrations, the West of Ireland’s first Hedge School Seminar of 2012 was hosted, on Friday 16th March at 7pm in Clifden Station House Theatre. 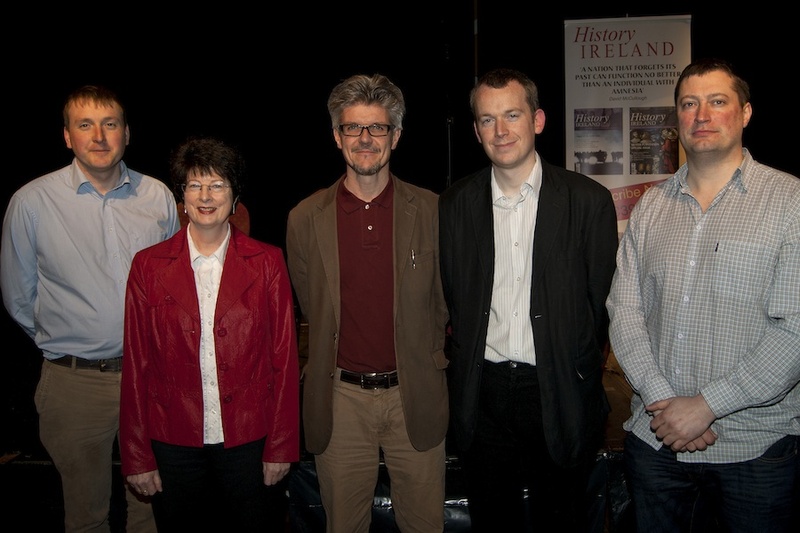 History Ireland Editor, Tommy Graham, hosted this lively round-table discussion with Mary Harris (NUIG), Conor McNamara (Notre Dame), Cormac Ó Comhraí and Pádraig Óg Ó Ruairc (UL). Audience participation was a major element of the Hedge Schools and there a lively discussion on the night. The discussion included references about the effect of the War of Independence on the Clifden area, including the burning of Clifden on March 17th 1921 by the black and tans and the execution in Mountjoy Prison of local man Thomas Whelan for his alleged part in Bloody Sunday. Guest of honour on the night was Galway centenarian Eileen Lovett, who lived in Clifden at the time and remembers the fateful night when Clifden was burned by British forces. The speakers are L-R: Cormac Ó Comhraí, Mary Harris (NUIG), Tommy Graham (Editor, History Ireland), Pádraig Óg Ó Ruairc (UL), Conor McNamara (Notre Dame).